ZOWIETEK ELECTRONICS AT CMEF 2018 - Zowietek Electronics, Ltd. The China International Medical Equipment Fair (CMEF) will be held in Shanghai from April 11th to 14th 2018! 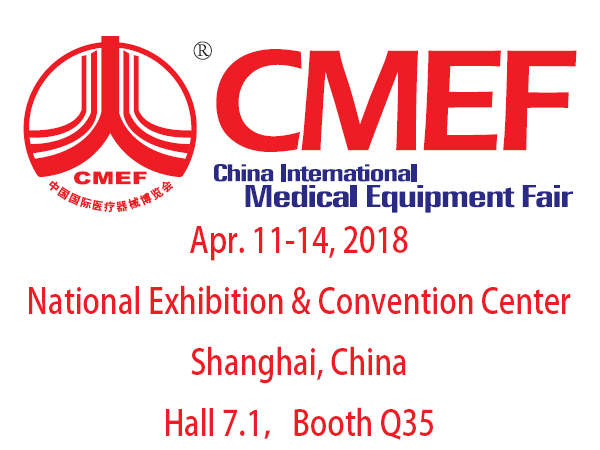 Visit us to see live equipment demos and great show specials in Hall 7.1 Q35, National Exhibition and Convention Center (Shanghai).Click here to watch CMEF live medical video broadcast to learn more. Zowietek Electronics will focus on demonstrating the industry’s first stand-alone, compact, multi-functional portable high-definition medical video recorder, an affordable medical-grade video recorder. It is standalone, internal battery can supply surgical recording up to 5 hours. External medical grade power adapter can be connected for longer recording time or fully charge the battery in 2 hours alone. It is as small as palm that you can take it to anywhere. It can record high-definition crisp1080p video from endoscope, arthroscopy, surgical camera, C-Arms, ultrasound etc. Saves extremely clear still images and videos to an internal removable HDD external USB HDD, USB Flash, SD Card or network. With HDD it can record highest quality HD video up to two weeks. It is just plug and play. It has universal video connectivity and compatibility, the dual video input formats enable compatibility and integration with virtually all surgical system manufactures. It accepts DVI, HD/3G SDI and HDMI. It also has SDI loop output. Beside, we will also demonstrate the Desktop Medical Video Recorder, The MediDVR MD1 features a wide range of video interfaces and types: CVBS YPbPr DVI VGA S-Video HD/3G SDI HDMI as well as 1080i50/60 or 1080p50/60. It can record high-definition crisp1080p video from endoscope, arthroscopy, surgical camera, C-Arms, ultrasound etc. We will also provide live video of the show. To learn more about Zowietek Electronics’ new medical device solutions and real-time medical streaming media, visit the Q35 at Hall 7.1 from April 11th to April 14th. We look forward to seeing you in Shanghai!